This series provides all you need to know to be the musician you want to be! Each package includes an easy step-by-step 60-page book and a one hour compact disc filled with useful exercises and professional arrangements. This complete music instruction studio is all you need to begin playing �harp' like a pro. 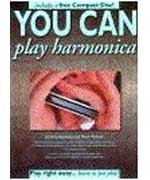 The basics of solo harmonica playing can be mastered in just a few weeks.